There are far more entrepreneurs than most people realize. 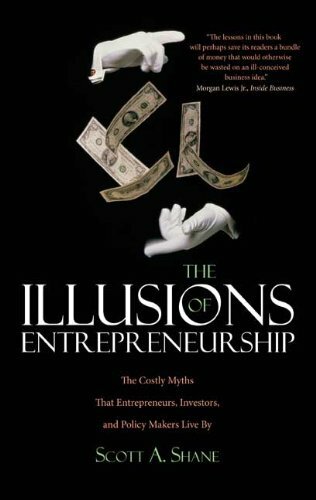 But the failure rate of new businesses is disappointingly high, and the economic impact of most of them disappointingly low, suggesting that enthusiastic would-be entrepreneurs and their investors all too often operate under a false set of assumptions. This book shows that the reality of entrepreneurship is decidedly different from the myths that have come to surround it. Scott Shane, a leading expert in entrepreneurial activity in the United States and other countries, draws on the data from extensive research to provide accurate, useful information about who becomes an entrepreneur and why, how businesses are started, which factors lead to success, and which predict a likely failure. · Why do people start businesses? · What industries are popular for start-ups? · How many jobs do new businesses create? · How do entrepreneurs finance their start-ups? · What makes some locations and some countries more entrepreneurial than others? · What are the characteristics of the typical entrepreneur? · How well does the typical start-up perform? · What strategies contribute to the survival and profitability of new businesses over time?